Are you actively spreading seeds around your community? Seeds are anything that have a long shelf life and have a chance to sprout you up some new virtual tour business down the road. In our line of work, seeds could be your active online craigslist ads that have links back to your website, your trade show handout CD’s, a glossy handout, a postcard and finally my personal favorite, the Tour Disc. Jim and I, as well as many other highly successful RTV virtual tour providers out there, mail a Tour Disc to the home seller once the virtual tour has been posted online. The Tour Disc is mailed directly to the home seller as a gift on behalf of the listing agent and your virtual tour company. When anyone puts the Disc into a CD ROM or DVD ROM a nice presentation begins showcasing the listing agent, your website and of course that specific virtual tour. Tour Discs that are sent to home sellers have an amazing impact on you and your customers. Do you know how many phone calls RTV gets from home sellers who have moved into their new homes and would like to have a copy of their virtual tour? LOTS!! Homes are highly emotional material items that are the playground for many of our past memories. A Tour Disc will cost you roughly .40 to create and will most likely bring you business down the road. Imagine being in business for two or three years and having your Tour Discs in over 1000 homes in your area. Since we get calls all the time from RTV providers asking how to make these awesome virtual tour CD’s we decided to have a show that’s 100% dedicated to the Tour Disc creation process. Please join me at 7:00 Eastern on May 4th for The FORMULA 27 – The Tour Disc as we explore how to add this delightfully subtle marketing seed (and free gift) to your property marketing company. It seemed I woke every hour on the hour last night anticipating the Halifax Entrepeneur Expo today at the World Trade Center in Halifax. My Nova Scotia Virtual Tour Company was going to be there and would be looking forward to several main stage speakers such as Gair Maxwell owner of The Seamless Brand and author of “Nuts, Bolts, and a Few Loose Screws” (I obtained an autographed copy!) Robert Steele President and CEO of Capital Corporation in Newfoundland and Owner of The Steele Auto Group and keynote speaker Richard St. John. A self made millionaire from Halifax and author of “The 8 Traits Successful People Have in Common”. It promised to be an exciting day. Gair Maxwell was the perfect choice to kick things off with his energizing and unconventional insight and approach to Brands. Maybe it was because it was first thing in the morning, and I was fresh and eager, but his speach impacted the most and his personal words to me will change the focus and way I conduct my future virtual tour business. Gair said this: A brand is not a logo, nor a tagline nor an advertising strategy. A brand is a story embedded in the mind of the market. It is intangible. 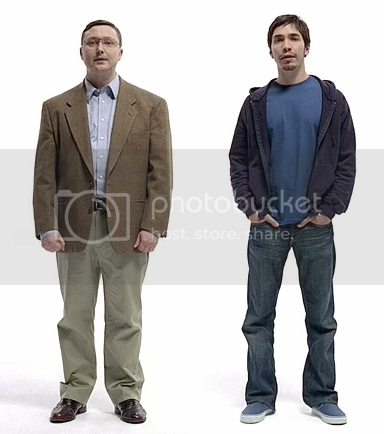 To illlustrate his point he showed the photo of the cool Mac guy and the geek pc guy. The story? Buy a Mac and you will be cool. Branding is the tangible process of creating signals that trigger feelings. Great brands trigger an emotional response. He explained that you will get lost in the sea of service providers if you fail to offer a product or service that is remarkable, worth talking about and worth sharing. His analogy: in field after field of brown cows it would take a purple cow to be noticed. He called it Purple Cow status. Being remarkable. Different. Maybe, a little unconventional. He said that boring, flat and dull was risky business. He encouraged us to build trust, a raport, a buddy-buddy relationship with our clients. He discussed ad campaigns that satisfied each of the senses: sight, touch, smell, sound and taste. He said an ad campaign was successful if you either loved it or hated it. That indifference was not a good thing and there was no middle ground. He encouraged us to be concentrated and grounded on principles that will always exist. And finally almost comfortingly, he said the 5 year business plan is a thing of the past. As long as you can see 200m in front of you, you are okay. I can see that far! When he finished I knew. 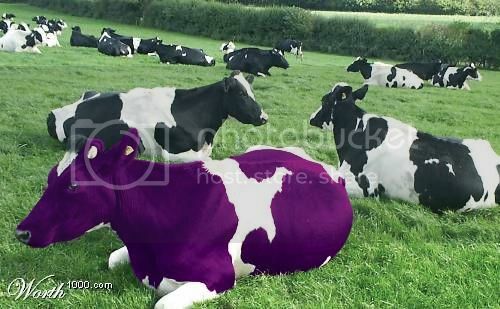 I wanted to be a purple cow! After the session he made his way to the Tradeshow where I had an opportunity to introduce myself personally. “Hi. My name is Nancy Bain and I want to be a purple cow”. He smiled, I don’t think that was the first time he heard that. “What do you do?” he said. “I offer marketing solutions to Nova Scotia Realtors”, I said. His reply, I will never forget. Ever. “I’m worried for you.” “You will never be a purple cow if you only market to Realtors”. I had the most profound realisation in the moment. He was right. I had been limiting myself. There is an entire commercial audience, endless possibilities of future virtual tour, text message marketing, and web clients. I was thinking too small! In a few short words, with incredible insight he had defined my largest stumbling block. MYSELF! It was Seth Godin who wrote the book Purple Cow. I bet it’s worth a read too. Our virtual tour company recently joined a local Realtor’s Association and will be attending our first monthly luncheon with them in April. This luncheon will be the first impression that many agents will gain and we want to be able to get something into the hands of each real estate agent. There will be approximately 60 agents attending this luncheon and I would like to place some of our virtual tour marketing material at each person’s seat. Out of the virtual tour marketing material that RTV provides online that we can modify with our company info, what 1 or 2 pieces would you advise to be the BEST for this situation? Obviously we will leave our business card which has our branding. Would you advise a virtual tour brochure such as a 1 pager, a tri-fold brochure, or a postcard? We want to make a good first impression and we are willing to pay for good quality printing- we are just trying to narrow it down out of all the options. For this situation I would recommend setting up a situation that will drive those very people back on over to your website AFTER the event. Use a small business sized CD from CD-Rom2go.com, the vinyl sleeves, and a printed paper or glossy label. To see the model number of the Cd’s, Sleeves, and labels that I recommend using please login to www.rockpointemarketing.com and click on the BRC, Setting up your Business, then on Setting your pricing. Scroll all the way down on this page and look for the cost analysis page. This page will have everything you need on it. Once you have your CD’s ready to go with your labels I recommend that you use www.autorunmax.com to create an impressive company presentation CD geared towards real estate. You can find a very nice ready to go presentation on www.rockpointemarketing.com under the presentations section. This is literally ready to go for you and comes highly recommended by me. The presentation allows you to select a music clip that you would like your CD to autoplay with and also comes with ready to go loaded graphics. Now for a grand finale! You should tell people that you’re giving away 50% off to the first X # of people who put in that CD, click over to your website and register with you. In lieu of a 50% off you can also do a Free Exposure Engine, Free Single Property Website, Free Elevated Shot, or Free Night Shot session. The 14th person to register with you will be a 50.00 gas card. Do whatever you would like to do but at the end of the day you really want them to come to your website and sign up with you so you can start email marketing to them. If you’re really slick you can tell them that they can come to your website and register for your free Social Ignition course. Whatever you do just make sure that you have a direct response mechanism built into your handout. Well, I really hope this helps! At the end of the day I highly recommend that you do CD marketing as opposed to handing out paper and flyers at these meetings since you can pack so much on such a nifty little CD! Postcards, catchy, to the point and effective. People are inundated with numerous, emails, publications and work related documents to read. These simple marketing postcards highlight the new HD virtual tours, the importance of being proactive and focusing on your community. They require a minimal time requirement for the information to be conveyed and are eye catching. This increases the chance that they will be read and remembered! Landscaping services and gardening facilities are in full swing during the spring. This two page flyer highlights the unique ability of virtual tours to showcase their stunning creations even during the bleak winter months. If you haven’t shared the exciting new technology of full screen high definition tours yet, then this is the flyer for you. We are so excited to roll out this new technology and can already see it is transforming the virtual tour into an amazing experience. Each month we strive to help you become more efficient and better connected to existing and potential customers. Our marketing pieces are easily customizable and typically just require you to insert your specific company information and logo. We recommend using Vistaprint for postcard printing and other printing needs. They seem to have fast service and extremely great rates. Take a moment to read the text through and make sure your company can deliver the services delineated. If you can’t or don’t know how to provide a service such a bird’s eye view shots or nighttime stills, contact us and we can set you in the right direction. If you have an idea for a piece, suggestions, or want to see something in the next few months send me an e-mail. As our virtual tour services, provider network, and virtual tour technology offerings keep expanding we have added new staff to meet your needs. Please welcome Megan and Melissa to team RTV. Megan Ebersole will be joining us in the camera setup department and will be your contact for new camera setups, rotator settings, and more. Megan loves photography and has been involved in film photography for over 12 years. She also has recently made the transition to digital photography with a Nikon digital SLR. She is very customer service oriented which comes from her involvement in retail and other industries. We are excited to have her as part our RTV Staff and look forward to what she will bring to the team. Melissa Vernon is our new digital imaging specialist. She will take care of image editing and photo delivery for our Tour Track orders. Originally from sunny San Diego, California Melissa moved to Traverse City 3 years ago when her husband was transferred to the local US Coast Guard air station. Melissa has a diverse background in the arts and photography has always been a hobby. She graduated from San Diego State in 2006 with a bachelor’s in fine arts and a minor in psychology. Currently, she is finishing up a second degree online in web and graphic design.